Spring is here at last! Can Summer be far behind? Sadly, we have to wait a few more weeks for real warm weather here on the Great Lakes. Until then, we’re dreaming of lazy days spent on a true symbol of Summer: the pontoon boat. We love their versatility. The broad, flat deck was made for sunbathing and lounging, and most models can tow skiers and tube-riders, too. Here are three new pontoon boat models from three of the Skipper’s favorite brands. We have parts for all three boat brands in stock right now! Bennington Pontoons' website has a nice “build-a-boat” tool, allowing you to choose among their many models based on which features you like best. We chose the SX24 Dinette model to show you. As its name suggests, the SX24 is twenty-four feet long, including an aft swim platform with ladder. The SX24 Dinette is designed for on-water entertaining with a corner galley that includes a wine rack and a sink, plus cushy seats placed around an LED-bordered table with three illuminated cup holders. Plush, pillow-top upholstery invites lounging, and there are cup holders throughout the boat to keep your drinks secure. The well-appointed cockpit includes an adjustable captain’s chair and a stainless-steel wheel. Easy-to-read gauges are set in a one-piece fiberglass console with teak trim and a locking storage compartment. You’ll find the stereo here, too, with Bluetooth capability to pump music through the boat’s four speakers. Put up the bimini for shade or rain protection, or leave it down for some serious sun worship. Fishing from a pontoon boat? Yes, please! The Sun Tracker Fishin’ Barge® line adds fancy fishing gear to a roomy pontoon design for a fishing platform everyone can enjoy, and the 22 DLX includes many nice features at an affordable price. 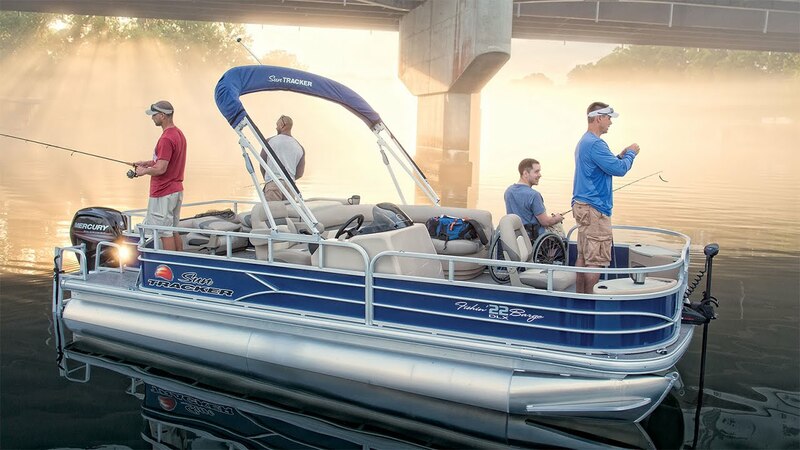 Two aerated livewells with rulers built into their lids, removable fishing seats, a trolling motor with foot-pedal control, fishing rod holders, and rod lockers are some of the features available on all 2016 Fishin’ Barges®. We haven’t even mentioned the QuickLift™ bimini top, Bluetooth-compatible stereo system, or comfortable lounge seating. The nonskid swim platform off the stern has a fold-down ladder. You’ll find plenty of cup holders on this boat, too. Here’s the Fishin’ Barge® 22 DLX in action. Doesn’t this look like fun? This particular video highlights one thing that a lot of us never have to think about: with their spacious, flat decks and wonderful stability, pontoon boats are much easier for people with disabilities to board and enjoy than other powerboats. We shared the double-decker Windjammer Funship from Avalon Pontoons on our social media earlier in the week. Let’s take a closer look at this ultimate party platform. The standard cockpit, with its wood-grain dash panels and soft-grip steering wheel, is worthy of a high-end yacht; it features a Garmin depthfinder/fishfinder and a Bluetooth-capable stereo system with lighted speakers and USB and auxiliary ports. At the helm of the Funship, you’ll sit in an admiral’s chair with self-leveling arms while your guests relax in the bow lounge or sip wine at the smoked-glass table in the shade of the upper deck. Speaking of which, the upper deck offers stereo speakers, a queen-size lounge, and of course, a waterslide. The pop-up privacy enclosure in the Funship’s stern makes it easy to change into swimsuits or dry clothes. Check out this video by Avalon and spot the Funship at 2:54. Options for the Funship include full and half camper covers, a livewell, saltwater anodes, a wine rack, and several different floorings. Also offered is a rub rail lighting package (available at Great Lakes Skipper now for retrofitting) and dozens of other upgrades. The Funship really has something for everyone, of all ages. This entry was posted in General and tagged tracker marine, sun tracker pontoons, sun tracker, pontoon boat, pontoon, funship, bennypontoons, bennington pontoons, avalon windjammer, avalon pontoons on March 25, 2016 by admin.